If you want to create something simple, but still cute, try making your own lace bracelets. All you need is some lace and snap fasteners. Or if you want to make things easier, you can simply cut the lace and tie it in a bow. However, if you own a bangle and you want to make it look more elegant, you can glue some lace around it and it will look stunning. And if you are not into bracelets, you will surely like the idea of a lace choker. Give your boring clothes a makeover by using lace trims. You can add lace to a skirt, a shirt, an old pair of jeans or even to collars and sleeves. Also, you can patch your jeans’ holes with lace. Just trust your imagination! You will undoubtedly like the final results. How would you like a candle jar holder? This DIY project can easily turn into an amazing present. All you need to do is take an empty glass jar and simply wrap some lace around it. Candles’ lovers will surely appreciate the effort of making a candle jar holder. If you want to make your picture frame look more elegant, use a hot glue gun in order to add some lace ribbon. The result will be astonishing and you will surely want to glue lace on all your home decorations. 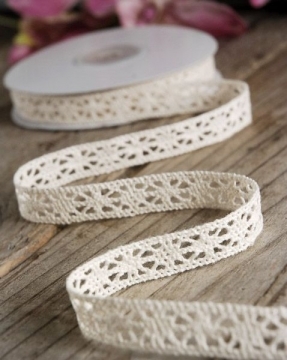 Where can you buy lace ribbon? This is an easy task. Lace can be found both in online and in offline stores. If you want to make a quick DIY project and you need to immediately buy some lace ribbon, try going to your local haberdashery stores. But if you want to take your time and search the Internet for sewing and haberdashery supplies, then you have infinite possibilities. There are more and more online shops that sell not only lace, satin or mesh ribbons, but also zips, pins, needles, and buttons.